I have been meaning to write about this pair of veg for a week or so and the photos do not really show the size of the plants today. The recent warm and wet weather has suited them both and they have doubled in size in the past week. The two veg have nothing in common at all really apart from their names and both are what might be termed ‘unusual’ veg. The pair are asparagus pea and New Zealand spinach – nothing much in common there I admit. But the botanical name of asparagus pea is Tetragonolobus purpureus and that of New Zealand spinach is Tetragonia tetragonioides. Tetragonia means four-lobed and ioides means like so New Zealand spinach is the four-lobed-like four-lobed plant and asparagus pea is the purple four-lobed plant. It is quite hard to imagine quite what these plants could possibly look like apart from a Rubiks cube! Anyway, to deal with more practical things in some sort of order, New Zealand spinach is not even vaguely square, not in stem or seed or flower so I can’t think where its name comes from. It is a low, sprawling, tender perennial normally grown as a frost-tender annual. It is unusual because it is in the Aizoaceae (the same family as lampranthus and portulaca) and there are not many edible crops in the family apart from purslane. The plant is also unusual because it is one of the few world-wide crops native to New Zealand. The seeds (or more accurately fruits) are strange and very large. They are almost 1cm long and hard with two horns so are easy to handle and sow and impossible to mix up with any other plant. These can be sown in pots or cell trays under glass in March or April or sown direct where they are to grow, in May. You can soak the hard seeds but I didn’t bother and they germinated perfectly well and the seedlings grew strongly. I planted them out about three weeks ago and I know I put them too close, at about 20cm, but I hope they will make a weed-smothering blanket of leaves. I have a feeling I will have a mound that spreads across the bed like suds out of a washing machine with too much detergent. 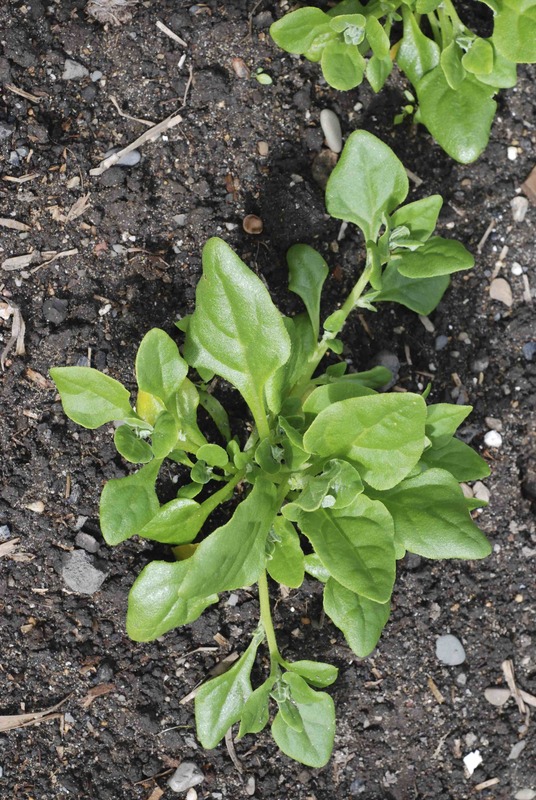 The main reason for growing this is that it doesn’t run to seed like ordinary spinach and is easy to grow even in dry soils. You need to keep picking the shoot tips off to eat regularly to keep the plant under control. The leaves have a mild, spinach taste and raw they taste a bit like peas at first but with a peppery aftertaste. It is a useful addition to salads but the leaves do contain oxalic acid. However they probably don’t contain as much as real spinach. Boiling and steaming removes some of this so if you are worried it will be best to cook it before eating. It is said that it is immune to all pests and diseases and that even slugs won’t touch it. I must admit that it is refreshingly free from any signs of nibbling so far which is slightly worrying for something that is edible, but as I have just lost half my sunflowers to slugs I must be grateful for small mercies. I am sure my two clumps, each of six plants, will keep us all supplied with as much as we want all summer. Now the plants are bigger they have been very productive. There are two clumps of 10 plants and the shoot tips are picked once a week. Each clump produces enough for about 4 portions each week. 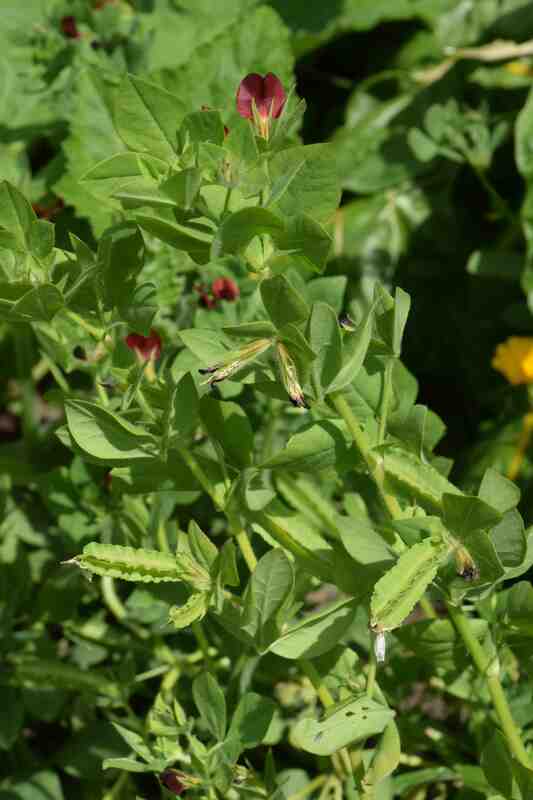 Asparagus pea is a very different plant. Rather than trying to be a relatively boring veg (spinach), this one pretends to be asparagus. Well it hardly pretends to be asparagus because nothing could look like that most majestic of veg. But the pods, which are the bits you eat, are supposed to taste of asparagus. This is a crop that I have grown before but not every year. It is easy to grow but a complete pain to pick and the best place to grow it is in raised beds or even pots and certainly in your own garden where you can visit it every day and not at the allotment where you only visit once a week. It is native to the Mediterranean area but common in many warm areas of the world and is a pretty plant. In some areas of the Med it is called red dragon’s teeth. 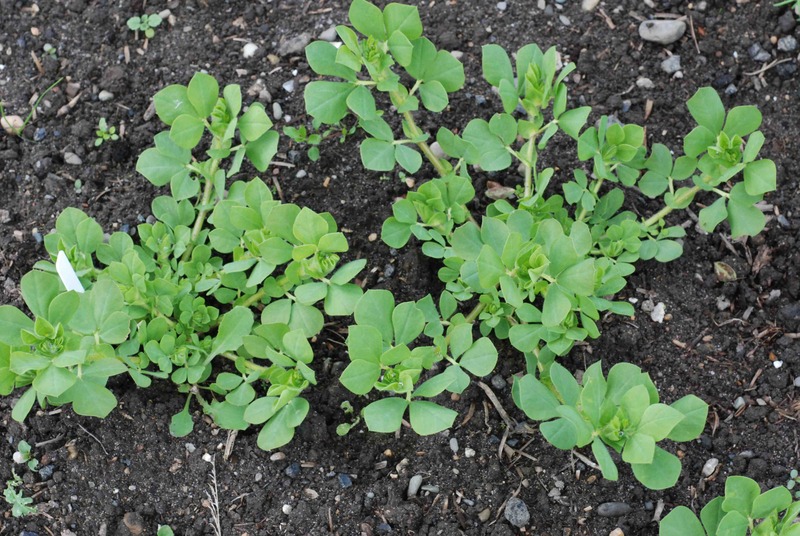 It is a legume and has small, pea-like flowers and is a scrambling, spreading plant that is generally not bothered by problems. I sowed two seeds per cell and left both to grow if they germinated. I planted them out about three weeks ago and they have grown well in a sunny spot. Sun and warmth is important for this crop. Despite its botanical name the flowers are deep red and not purple. When they fade they are followed by a strange pod that has four wings. The pod itself is slim and cylindrical but looks larger because of these leafy wings. If kept picked the plant has the potential to crop for a long time. Asparagus pea is an interesting crop but you won’t get fat on this one! The trouble is that these pods must be picked soon after they start to develop, when they are no more than 4cm long and ideally 3cm long. If you let them get any bigger they get very tough and are almost inedible and it is certainly hard to swallow the mouthful of chaff you end up with. So you have to go over the plants at least every other day and pick all the pods that are at the edible stage. You need a lot of time and a lot of plants to get enough for two portions. You should steam (or boil) the pods for a short time. This might be a good crop for anyone that stir-fries a lot and can throw in a few of anything at hand! Having said this the flavour is pleasant and the delicate pods make a nice change from other crops. And those four wings on the pods have the advantage of hanging on to extra melted butter – making them taste even better. It is an easy crop to grow and one of the prettiest veg you can grow, certainly worthy of a place at the front of the flower bed, but it is not a veg you can pop out and get a quick meal from. The plants are now fully grown and have produced a lot of pods. The trouble is they quickly change from being too small to pick to too tough to eat. They are small and fiddly and no one can taste the asparagus! The somehow combine not quite being a good veg with not being quite ornamental enough for the border.